I’m glad to show you the results from a recent shoot I had with Artsobu. Following my Hell Bunny shoot with her, we decided to shoot this incredible look, which has become a basic in my wardrobe during warmer days. 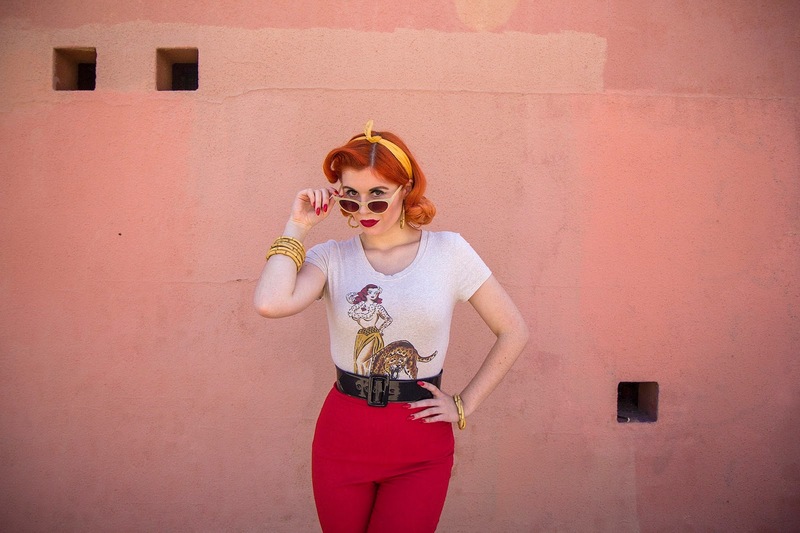 This beautiful tee features a cool and fierce design that I’m sure all redheads will love! I’m not used to wear scarfs on my hair but this outfit called for one. This tee is very stretchy and comfortable, and I ordered my usual size – M -. Fits like a glove! I can’t wait to wear this design more often this Spring / Summer! This entry was posted in fashion, reviews and tagged fashion, goldie's clothing, mischiefmade, miss sixties twist, pin up fashion, the sixties twist by misssixtiestwist. Bookmark the permalink.